I had a bit of a rediscovery this month in the form of the Bourjous 123 Perfect CC Cream which I actually have a full post on here. This has been collecting dust in my collection and I forgot how much I love it. Despite it being a CC cream, the coverage is incredible and I love this for days when I’m in a hurry as this blends seamlessly and quickly. I’ve also been loving a glowy cheek this month, and two products that stand out are the Milani Baked Blush in Luminoso and the Bobbi Brown Shimmer Brick in Beige. The blush is a gorgeous peachy coral shade (can you tell I’m excited for summer) and surprising the Shimmer Brick is not the most shimmery highlighter I own – it gives a stunning glowy highlight without looking like a disco ball. Love. The final makeup products I want to share today are all to do with eyes. If you read my last post, you’ll know that I recently got the Too Faced Chocolate Bar Palette and this has been my go-to for eyeshadow recently. It’s great for the more natural everyday looks I want to achieve and also has some smokey and colourful shades to take me through to the night. Finally, the Mac Tan Pigment had to get a mention. If I had a perfect eyeshadow colour, this would be it. It is a highly shimmery, rose gold-esque shade, and it is beautiful. Usually when it comes to hair, I don’t really bother doing much with it. I have naturally straight hair and while I don’t love the flatness of it, it looks good enough for me to get away with its natural texture. A product I used to use all the time was the Charles Worthington Volume and Bounce Body Booster Mousse (post on the whole line here) and since I have recently been craving some more volume in my hair, I pulled this out of my stash and started using it again. I have been using this every time I blow dry my hair and I have fallen back in love with it. It provides a lift at the roots but doesn’t leave my hair feeling gunked up with product which is something that I hate when it comes to mousses. This is some great, and affordable, stuff. I have also got into using the Phillip Kingsley Elasticizer as a hair mask about once a week. This leaves my hair looking so full and healthy, and my hair honestly looks at its best just after I have used this on it. This month seems to be filled with rediscoveries – I recently repurchased the balance Me Radiance Face Oil (full review here) and it has been doing my skin wonders. For those of you who have oily/blemish-prone skin and are scared of putting oils on the skin, don’t be. This really helps to clear any blemishes I have without drying them out. It nourishes and balances my skin and is overall a great product. For the body, I have been loving the Rituals Fortune Scrub. It is a really effective exfoliator without been too harsh and scratchy on the skin. It has a citrus scent which is very invigorating and fresh in the shower which I love. A rather random favourite this month has been the LaVanilla The Healthy Deodorant in Pure Vanilla. I picked this up while I was in New York as I was looking for a more natural deodorant and I have to say this stuff actually works wonders. It keeps my underarms dry all day and it smells really sweet but isn’t so strong that it competes with your perfume. Speaking of, my favourite scent of the month has definitely been Yves Saint Laurent Black Opium. I received this a christmas present and it is one of the most unique and interesting perfumes I own. It has a combination of vanilla and coffee notes which results in a sweet, rich yet dark and sultry scent. I feel like favourites posts are meant to be fairly text heavy, so I hope you find these mini reviews useful! 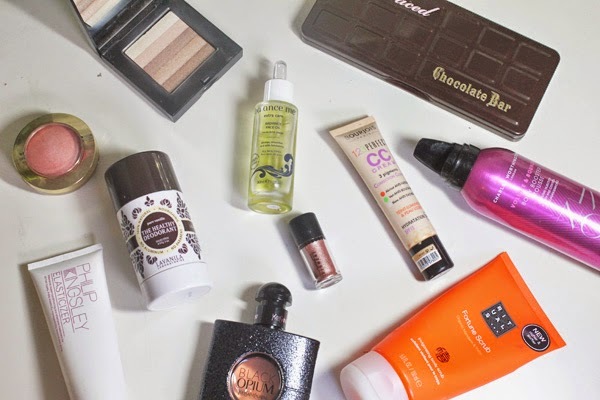 I didn’t include any lip products in this post as I always have so many favourites that this may have turned into a dissertation… Let me know your current favourite products below! You picked some lovely things! Black Opium is one of my absolute favourites – it smells amazing.